My daughter, Rebekah, is a very good cook and a wonderful mom to my four precious grandsons. A few years ago she decided to make and sell fudge for the holiday season. 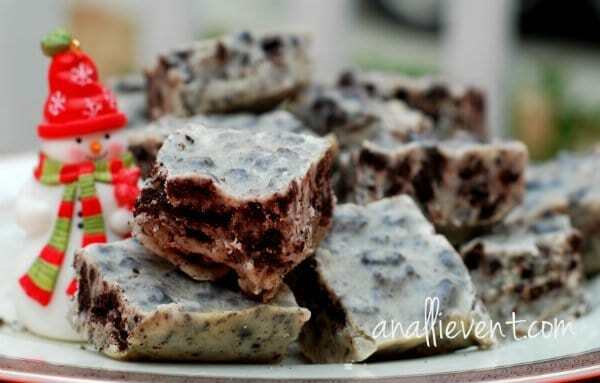 She got busy in her kitchen and promptly created several original fudge recipes and she was in business. After giving birth to her 4th and last boy a couple of years ago, she has been way too busy to keep her little fudge business going (maybe she will do a restart later) but after much cajoling, she gave me one of her recipes to share here. She kept debating whether she would share her Birthday Cake Fudge or her Cookies and Cream Fudge. In the end, Rebekah’s cookies and cream fudge won out. This fudge is not only delicious, but it’s best made a couple of days ahead of time. Enjoy! Line a 9" x 9" pan with foil and butter the foil. In a medium saucepan over medium low heat, combine sweetened condensed milk and butter until the butter is melted. Stir constantly. Add white chocolate chips and continue to stir until chips are melted. Remove from heat and stir in the vanilla and crushed Oreos. Mix well and pour into buttered pan. Smooth top and place in the refrigerator for 24 hours (or longer) to harden. Cut into small squares before serving. Do you make fudge? If so, what’s your favorite fudge recipe? The only fudge I ever make is Fast Fudge. But after taking these pictures of Rebekah’s cookie and cream fudge, I may just have to try to recreate her recipe. I’m wondering if mine will be as good and look as pretty. 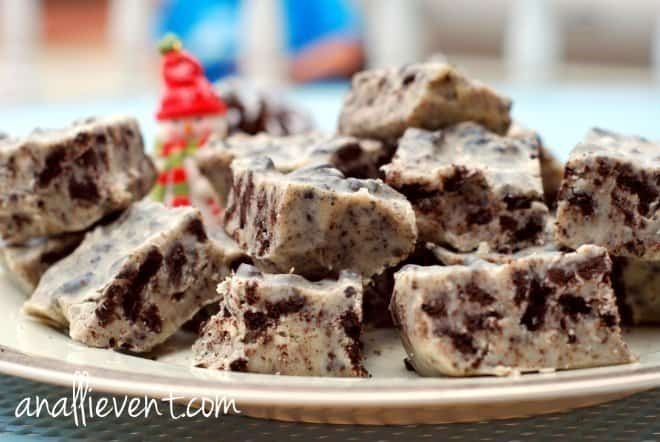 I don’t think I’ve ever had fudge with cookies, but I love the idea. The only fudge I’ve made is a plain chocolate fudge, but I’d love to play around with different flavors. My fudge of choice to make is peanut butter fudge; mainly because I have lots of family memories of making it every year while growing up. 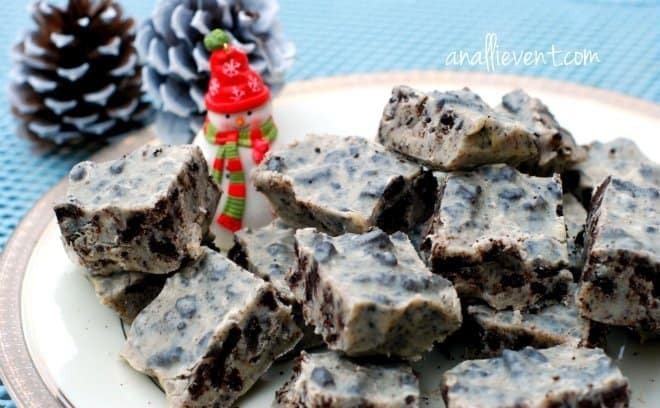 Nice twist on plain old fudge, though there’s nothing wrong with plain ole fudge! Lordy, Lordy, Lordy! That looks so very, very good! Thanks for sharing. Your family sure does produce some good recipes! The apple doesn’t fall far from the tree! I sure will and I’ll be thinking about you Friday! Have fun! Thanks, Mom for sharing my recipe! I love making fudge. I wish I wasn’t so busy and could do it more often. @ Ashley, Bobby was my best customer! I miss him and his love for fudge. I was working on a watermelon fudge just for him before he passed away. Hugs! More yummy fudge! This looks amazing!!! I was lucky enough to receive some for Christmas a few years ago, fantastic! Look forward to trying it myself, thanks for sharing! Measure peanut butter and vanilla and place in a bowl. Set aside. Butter an 8x8x2 dish and set aside. Mix sugar, cocoa and 1/2 cup water in saucepan. Bring to a boil and boil rapidly for exactly one minute. Pour over peanut butter and vanilla. Beat with spoon until thick. It thickens very quickly and will get overly thick if you beat it too long. Basically, once the chocolate mixture is mixed well with the peanut mixture, pour into buttered pan. Cut into squares when cool. Note: You may not want to make this when you are home alone. Trust me on this one. It has a tendency to jump off the plate and into your mouth!